French honorary distinction conferred on Pande - Integration Through Media ....! 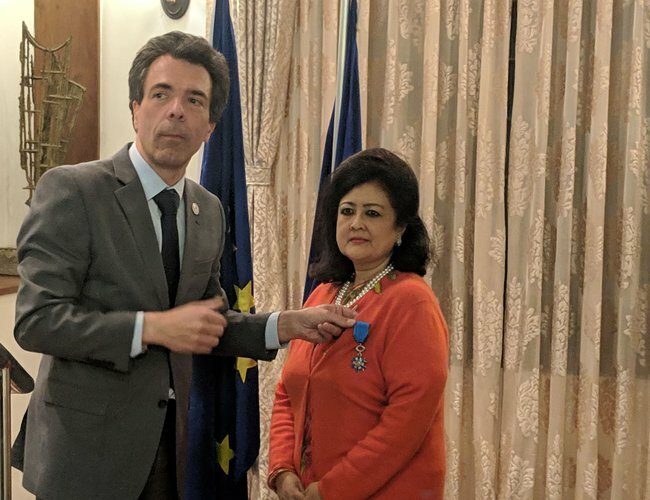 KATHMANDU: The Government of France has conferred the honorary distinction, ‘Chevalier de l’ordre national du Mérite,’ knight of the national order of Merit, on honorary consul of Italy to Nepal, Ms Pratima Pande. Ambassador of France to Nepal, Mr François-Xavier Leger, conferred upon Ms Pande the French honour on March 19 at the Residence of France. This honour is in recognition to her many years of selfless service to the Government of France, the Ambassador said during the award ceremony. The Embassy of France in Kathmandu stated in a press release today that Ms Pandé has a long relationship with France and especially through the Alliance Française, the French culture center. She was a member of the board between 2001 and 2007, then the Vice President between 2007 and 2011, and, finally the President between 2011 and 2017. During her many years with the Alliance Française, she was one of most active members who regularly lobbied for the interests of the Alliance Française and advanced the vision of the Alliance Française. During the award ceremony, Ambassador Leger recollected the role played by Ms Pande during the tough period for the Alliance Française and how “she never missed a single meeting and always attended cultural activities”. The French government’s honour Ordre National du Mérite (National Order of Merits) was instituted in 1963 by General Charles de Gaulle. It is awarded for distinguished services rendered in public, civil, military posts, or a private profession.